Venue : Barsapara Cricket Stadium, Guwahati. Virat Kohli(Capt. ), Rohit Sharma, Shikhar Dhawan, Ambati Rayudu, MS Dhoni (WK), Rishabh Pant, Ravindra Jadeja,Yuzvendra Chahal, Kuldeep Yadav, Mohammed Shami, K Khaleel Ahmed, Umesh Yadav. Sunil Ambris, Kieran Powell, Shai Hope(w), Shimron Hetmyer, Marlon Samuels, Rovman Powell, Jason Holder(c), Ashley Nurse, Keemo Paul, Devendra Bishoo, Kemar Roach, Fabian Allen, Obed McCoy, Oshane Thomas, Chandrapaul Hemraj. 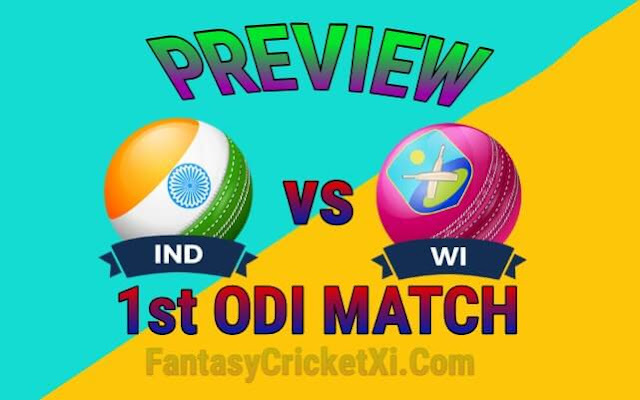 ➤ India Declared 12 Men’s Squad For This Match.Virat Kohli Will Lead Indian Side While MS Dhoni Will Handle Wicket-Keeping Duty. ➤ Rishabh Pant Is Debut In Odi In This Match. ➤ Shardul Thakur Ruled Out From The Series, Umesh Yadav Named His Replacement. ➤ India Have Won The Last Seven Bilateral Series Against Windies Starting Since Jan 2007. The Last Time Windies Won A Series In India Was Way Back In 2002. ➤ Virat Kohli Needs 42 More Runs To Complete 2000 Runs In International Cricket In 2018. He Achieved The Same Feat In 2016 and 2017. ➤ Windies Team Declared 15 Men’s Squad For This Series.Jason Holder Will Lead Windies Team & Shai Hope Will Handle Wicket-Keeping Duty. ➤ Evin Lewis, Alazzari Joseph & Nicolas Pooran Will Not Play.So, Don’t Take Them In Your Team. ➤ Kieran Powell Will Be a Sure-Starter As a Result, With a Number Of New Faces Like Obed McCoy And Oshane Thomas Who Could Get Debuts. ➤ Marlon Samuels Will Become The Eighth WI Player To Feature In 200 ODIs. Opener : Rohit Sharma With Shikhar Dhawan. Middle Order : Ambati Rayudu, Rishabh Pant, MS Dhoni, Ravindra Jadeja. Fast Bowler : Umesh Yadav, Mohammed Shami. Spin Bowler : Ravindra Jadeja, Kuldeep Yadav, Yuzvendra Chahal. Opener : Sunil Ambris With Chanderpaul Hemraj/Kieran Powell. Middlw Order : Shimron Hetmyer, Marlon Samuels, Rovman Powell, Jason Holder. Fast Bowler : Kemar Roach, Jason Holder, Keemo Paul, Rovman Powell. Spin Bowler : Ashley Nurse, Devendra Bishoo, Marlon Samuels.